You know it, we know it, everyone and his dog knows it. And finally we have some (almost) definitive news on a cut-down version of the iPhone that will be styled like the iPod nano. According to a Taiwan-based analyst close to electronics manufacturers there, an iPhone nano will be available in the fourth quarter of this year. The suggestion of a smaller, cheaper iPhone is no great surprise. The need for Apple to have a less-expensive version to appeal to those unwilling to spend $600 (£300) on a phone is obvious. Moreover, Apple recently applied for a patent for a phone with a nano-like control wheel. Naturally, the company has declined to comment on the rumours. Whether the new phone will look anything like the concept shown above ( source ) remains to be seen. 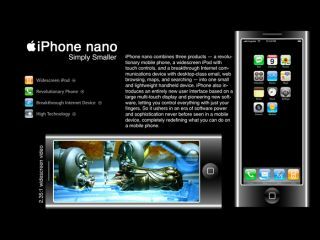 With an expected launch price of $300 (£150) or lower, any iPhone nano would be a clear and compelling competitor to mass-market phones currently sold by the likes of Motorola and Nokia. Additionally, it would extend the life of Apple's mid-range player. Speaking to Reuters , analyst Kevin Chang said, "We believe that iPod Nano will be converted into a phone because it's probably the only way for Apple to launch a lower end phone without severely cannibalising iPod Nano." On top of the new iPhone, other likely products from Apple include new full-size iPods with some of the features that make the iPhone such a hit. These include touch-sensitivity and wide screens for viewing movies.